I cannot cry anymore, at least not at the moment. This is alien to me. It’s not a bad thing per se, except i feel like i need to cry and i can’t. Usually i cry so much, so often and so easily (from nowhere, sometimes) that it is embarrassing. I’m the one silently weeping on the bus. Usually. I stopped taking all medication a couple of months ago…so it’s not that. I self-medicate with weed, but that’s been consistent for the last 10 years or more, so it’s not that. I need to cry but it’s staying hidden under the surface, bubbling away, gaining momentum, liable to come crashing down on my like a ton of sand to suffocate me, at any given moment. Why can’t i cry? I think it’s cos I’ve had enough, the sadness is exhausting and overwhelming, it wrings me out. Ultimately, it is useless. I remember once in a biology class at school, asking the teacher why we cry. Not the physical aspect, but what purpose it serves; the tears, the snot, the guttural sounds. He could not answer me, and i have wondered about it many times since. We are social creatures, we live, strive, thrive on our interactions with other humans. From an evolutionary perspective, it’s one of a few reasons why our species has been so successful. 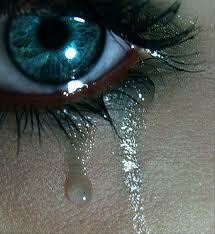 I think crying is a communicative display; it’s a visual sign that conveys an internal state to others. It says ‘i feel awful, please help me, comfort me’, in much the same way as a smile says ‘hey, i’m approachable, come say hi!’. For babies, it’s probably the most effective form of communication, and a very useful survival mechanism. Maybe i can’t cry anymore because i know it is useless. My sadness is a very private thing that few people are aware of, and even those closest to me that are aware, are not aware of the crippling extent of the desolation i often feel exploding in my solar plexus and infecting my soul. I wouldn’t want to worry them with it. If i have cried, wept, screamed, i have done so in private. It sucked away all my energy left me drained and sore and broken…and it didn’t fulfil a purpose, it didn’t communicate my pain to anyone that could hold me and make me feel safe. So my body has gone on strike. It is refusing to take part in such an exhausting pharce. It won’t cry. I thought i would feel better if i didn’t cry, back when i couldn’t stop it, but i don’t. I feel anxious, like I’m walking a knife-edge. I feel sort of detached from everything, not just from everything else, like usual, but from everything, my own self included. I feel like I’m watching myself, like the person who feels things is not me but just someone i observe closely, because i do not relate to her and her emotions. I do not relate to anything. Yes, i should stop smoking. I’m sure the waves would come crashing in then. I’m in this little cotton-wall bubble, shielded from feeling anything, good and bad. But i am (reasonably) safe, and that is something. When it came to crying I used to be much the same as you. Being a highly sensitive person I would cry over anything from Monsters Inc. to overcooked zucchini; not exactly something that a man should admit to. But I haven’t cried for a long time. The occasional single tear, maybe, but never a full on emotionally releasing bawl. I’ve become numbed to emotion as a coping mechanism, which I’m not really happy about, but my minds gonna do what my minds gonna do. I do miss the emotional release of a good cry though, it always made me feel so much better. Maybe its a common emotional defense then? Maybe there IS a limit to how much sadness a body can take? I read that even though we don’t know for sure why we cry, there are stress hormones in our tears, so one theory is that crying releases some of our hormones, which explains why we feel such a release afterwards. I know I feel great after a good cry.